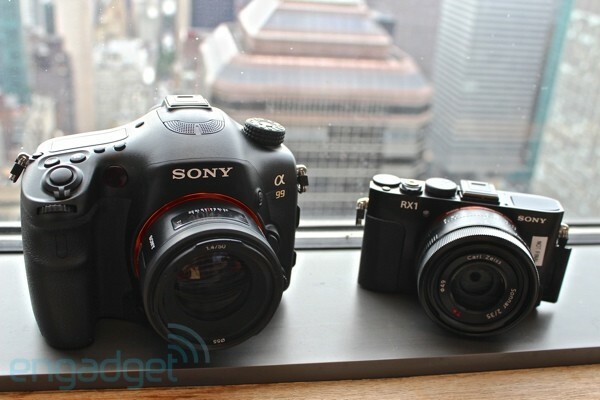 Would you believe us if we told you Sony packed a full-frame sensor in a Cyber-shot-branded camera? It's true! Say hello to the RX1, a "compact" digital camera for pros that's packing the same 24.3MP Exmor CMOS sensor introduced today with the A99. Calling the rangefinder-esque one-pound shooter small might seem off-base, especially considering the Zeiss Sonnar T* 35mm f/2.0 fixed prime lens protruding from its front, but it's not so huge (3-inches high by 4.5-inches wide) up against its tiny sibling, the RX100 -- taking into account how much larger the RX1's sensor is, well, that's when this editor's jaw basically dropped. While it's not a "pro-NEX" as many had hoped, Sony explained that it chose a fixed lens to avoid the bulk of a lens-mount. We were able to get some eyes-on time with an engineering prototype of the unit, so click past the break for more details, close-ups and a brief video overview. Although the attached lens is your only option for optics, it's custom-built to specifically complement the sensor. Internally, it's packing a 9-bladed aperture ring, which Sony says should help in creating some serious bokeh. Better yet, the lens features manual aperture and focus rings, not to mention a macro switch that mechanically adjusts the optics for close-up shots. In terms of ergonomics, the camera feels very much like a chunkier RX100, albeit with the aid of a hand grip this time around. Sony will also offer an optional -- and pricey -- TGA-1 thumb grip ($250) that threads into the shutter-release button. However, its rangefinder-styling doesn't come complete with any sort of viewfinder. You'll have to make due with its fixed 3-inch 1,229k dot LCD, featuring VGA resolution with RGB plus white coloring, for composing with its 25 focusing points -- at least of the box. Thankfully, an XGA OLED viewfinder ($600), similar to the one for the NEX-5R and F3, can be added on for those who want to compose at eye-level. 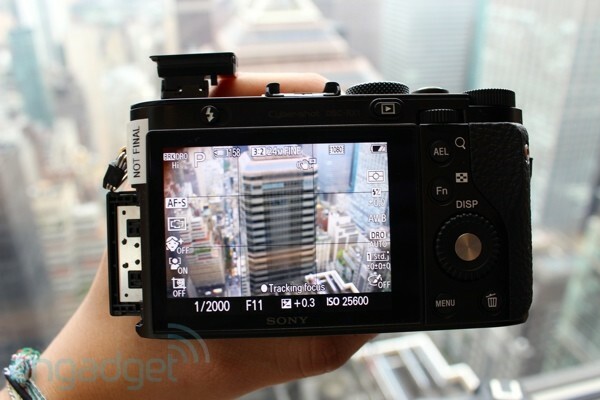 The RX1's version has merely been tweaked with a matching black color and a mount for its Multi-Interface hot-shoe. Don't like EVFs? 450 bucks will snag you an optical view-finder, for that rangefinder-style of composing shots. On the camera's top right you'll find dedicated mode and exposure compensation dials -- and that threaded shutter button -- while the left side houses a pop-up flash that can be tilted back à la the NEX-6 and 7. Moving along to the back, to the screen's right you'll find 4-button and a control wheel, manual control dial, dedicated movie button, and programmable function button, among others like the AE-lock. So what about image performance you ask? That 24.3MP sensor is driven by Sony's latest Bionz processor that we detailed in our A99 post, so you can expect images of nearly identical quality and 14-bit RAW files saved onto your SD card. That said, the autofocus onboard is contrast-based like the NEX-7 (not exactly ideal if for extreme low-light situations), while its burst rate tops out at 5FPS; these two points in particular are downgrades from the A99's phase-detection AF and 6FPS burst shooting. Native ISO range goes from 100 to 25,600, which can be extended as low as 50, and as high as 102,400 thanks to a feature dubbed Multi Frame Noise Reduction (simply put, many shots are combined to make one clean image in low-light conditions). Movie buffs will be pleased to know that the camera shoots 720p AVCHD 2.0 footage at 24 and 60p, with 30p delegated to the web-friendly MP4 format. You can feed the video-monitoring duties to an external monitor thanks to an on-board HDMI connection, while a 3.5mm jack can accept external microphones, making for an ultra-portable full-frame movie rig -- watch out, 5D Mark III. As we mentioned earlier, the RX1 is directly aimed at pros, with a $2,800 price tag to match when it hits shelves in November -- that's the same amount you'll fork over for the flagship A99, for those keeping count. That said, it's not like you'll be able to fit the A99 in your coat pocket. As far as unmentioned odds and sods go, you'll have to fork over another $180 for a lens hood and $250 for a leather case. Beyond that, the camera will be compatible with much of Sony's existing range of Alpha accessories. If it actually lives up to the hype, we'd imagine that this shooter might prove as a massively cheaper, potentially more potent option to likes of Leica's M9. Sadly, we weren't able to shoot with the RX1 to get a feel for its imaging chops, however, check out Sony explaining the camera to us in the video below. You'll also found more info in the press release just underneath it. Edgar Alvarez contributed to this post. "The new Cyber-shot RX1 is truly 'one of a kind', offering a unique combination of size and performance that's never before been realized in the world of digital cameras," said Yosuke Tomoda, director of the Cyber-shot camera business at Sony Electronics. "With its highly advanced sensor and fast 35mm f/2.0 lens packed into a small, portable camera body, professionals, enthusiasts and advanced hobbyists can experience the world of full-frame imaging in new and different ways than they ever thought possible." The large sensor size also boosts the camera's sensitivity range to a generous ISO 100 – 25600, with the option to shoot as low as ISO 50 in expanded sensitivity mode. Similarly, ISO settings as high as 102400 can be achieved using Multi Frame Noise Reduction. This allows the camera to capture natural, low noise handheld images in near-dark conditions without needing flash. The lens' wide F2 maximum, 9-bladed circular aperture enable beautiful background defocus ('bokeh') effects to rival or exceed professional-class DSLR camera lenses. Additionally, it features a macro switching ring on the lens barrel which instantly shortens the minimum focusing distance to approximately 20cm (from image plane), allowing the camera to capture small, close-up subjects with exquisite detail. Despite the camera's extraordinarily compact dimensions, the new Cyber-shot RX1 model offers a full range of manual control modes on par with typical high-end full-frame DSLR cameras. Dedicated lens rings allow for fingertip control of focus and aperture, while a DSLR-style Focus mode dial on the front of the camera enables easy switching between focus modes. Top-mounted exposure compensation and mode dials are strategically placed for simple access and operation, while custom function and AEL buttons on the back panel are also easily accessible. Also available for download, PlayMemories Studio™ allows game-like editing of photos and videos on PlayStation®3 systems. Images can be shared easily via PlayMemories Online™ service, the cloud-based sharing service from Sony that simplifies 'any time, any place' viewing on a wide range of connected devices.